Although the village of Versailles, Ohio is small in size, its production of eggs and poultry was recognized far beyond Ohio as it became known as the Poultry Capital of the Midwest at the turn of the century. This was due in large part to Gasson’s Poultry Farms which were recognized worldwide for their strain of Leghorn chickens, and the Versailles Poultry Producers which processed both eggs and poultry. Additionally, Weavers Bros., Inc., founded by George Weaver in 1929, continued to grow larger each year as a top egg producer and processor in the nation. The numerous poultry farms that operated in the area at that time included Rolls Turkey Farm, Begin Brothers, Swank Turkey Farm, Reigle Poultry, Greenhoff, and Ridenour as well as the companies that supported them: Alexander Bros Elevator, Rosenbeck Implement, Harvey Hole Implement, Ohio Egg Producers Association, Willowdell Grain and Feed, Amstutz Hatcheries. As such, truckers came to refer to Versailles as Chicken City. 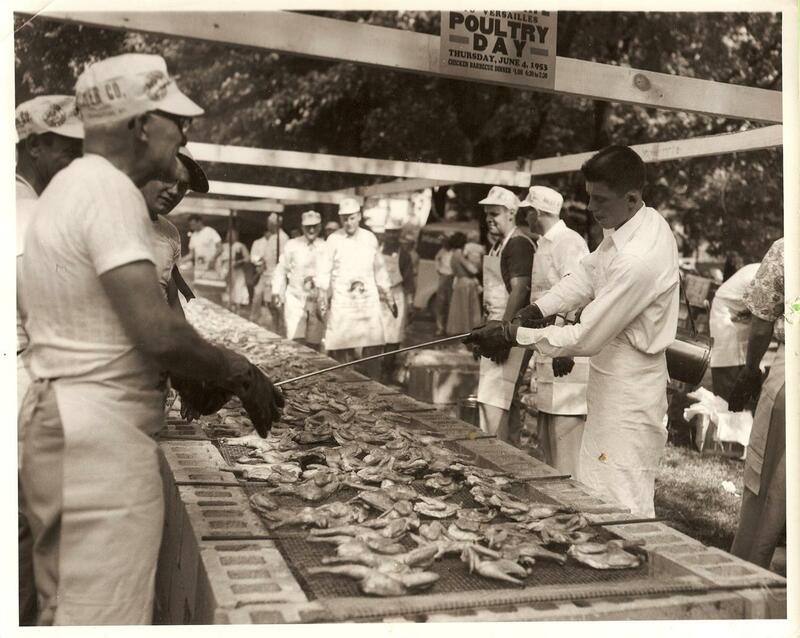 This rich history has been highlighted with the tradition of the annual Poultry Days Festival. The intriguing history of our local Poultry Days Festival began as a single day event held on a Thursday and referred to as Poultry Day. This first festival was small and community focused but grew quickly drawing visitors from surrounding communities and from as far as Dayton. In 1962, the Day was expanded to a two day event on Wednesday and Thursday. In 1966, the festival was moved again making it a weekend event held on Friday and Saturday. In 1969, expansion included the now ever-present carnival rides. Finally, in 1972, the annual Poultry Days Festival was expanded to a three day event on held on Friday, Saturday and Sunday. Arguably the area’s oldest festival, Poultry Days has settled into being held on the second full weekend in June. The length of time in which the festival lasts is not the only aspect that has changed over the last 64 years. Even the selection of foods available at the festival has evolved. Throughout the years choices included an egg smorgasbord, turkey and noodles, turkey burgers, and deviled eggs. In 1974, barbequed chicken was finally served throughout the entire festival. The first dinners cost $1.25 and included half a chicken, a roll, butter, chips, cranberry salad, pickles and a choice of coffee or pop. 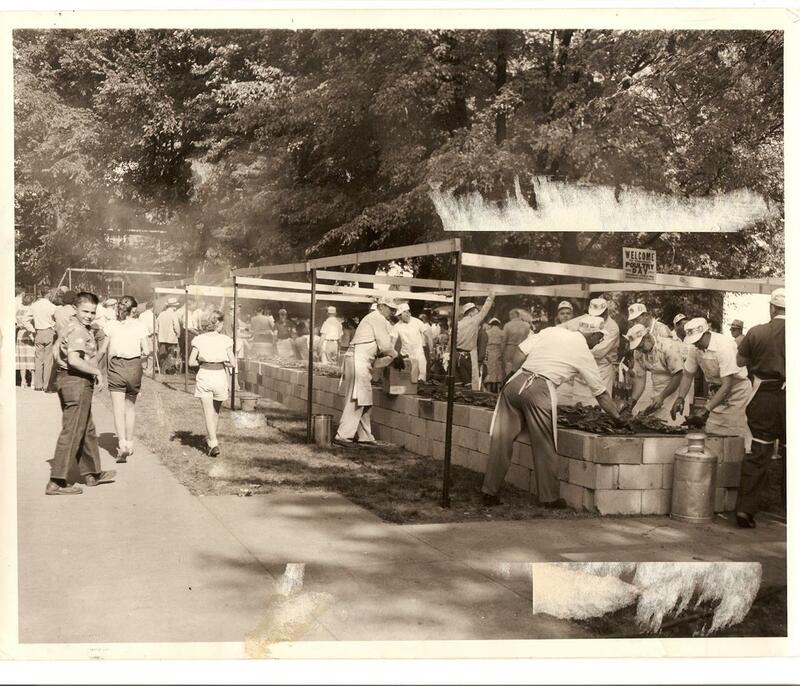 In 1952 alone it took approximately 125 volunteers to construct and operate the BBQ pits. As the volume of chicken served grew so did the army of volunteers who worked to deliver. By 1970, after 18 years of chicken dinners being cooked by local volunteers the festival had outgrown the capacity of these hard working individuals. After an exhaustive search across many states a partnership began with Nelson’s BBQ (formerly known as Port-A-Pit) a small, but growing, chicken barbecue business. Nelson’s was the only company capable of meeting the quality standards expected by the festival and cooking enough of those delicious World Famous chicken dinners to satisfy demand. This partnership continues today with the third generation of the Nelson family providing delicious chicken for Poultry Days, which remains their single largest annual event. The early chicken serving lines were ran by “The Ladies Serving Committee,” while the men ran the barbecue pits. A drive through line was added in 2001. Further enhancements have culminated in a smooth running operation which in 2014 averaged 1,300 dinners served per hour, with a peak of nearly 2,000 dinners per hour, or a dinner every 2 seconds. In a festival full of tradition the first “Miss Chick,” Bonnie Sue Besecker (Laura, Ohio), was crowned in 1952 and the festival has continued to recognize vibrant, dynamic, young women. The pageant has drawn as many as 112 contestants from throughout Ohio and beyond, requiring an extensive judging process that begins before the festival. Today the event is limited to young ladies from Darke and surrounding counties. Thirty-three years after the first Miss Chick was crowned a new tradition was born when Trisha Rhoades became the festival’s first “Little Miss Poultry Days” in 1985. As early as 1957 or 1958, Colonel Warner Nichols added the Grand Parade which he organized until his death in 1965 at which time John “Red” Elson took over. Red went on to start the successful Antique Car parade in 1973 which is now run by the Dickman Family. In the late 60s the Versailles Fire Department took over organizing the Grand Parade which has continued for nearly 50 years. Both parades continue today and draw in excess of 100 units annually making them among the largest parades in the region. The honorary Grand Parade Marshall position has been awarded to community leaders who are recognized for their contribution and volunteerism in the community. Festival events have included live chickens, ducks, a giant mystery egg, egg art, giant wishbone pulling, and a rooster calling contest. For many years duck races were a familiar sight and sound on the grounds. In the early 1970s, Poultry Days attempted to break the world record for the largest egg omelet with another attempt in 1982. This culminated in an omelet that measured nearly 9 feet in diameter and required 22,128 eggs, 100 pounds of onions, and 100 pounds of ham that were combined in a concrete mixer. The custom-built omelet pan was an exhibit for many years and ended up in the Versailles pool at least once. Two important chicken-related traditions associated with Poultry Days include the Giant Chicken Float and chicken painting. The Giant Chicken float first made its appearance in the late 80s and was originally purchased by the Versailles Development Association to promote Versailles. While known as the “Giant Chicken” in most parades this chicken was originally seated on a nest and had to be cut down to maneuver under power lines. Annual chicken painting started in 1996 to welcome visitors to town and later to designate board members and festival VIPs. The creation of a festival theme began in 1987 and since then selecting a fun theme has become one of the most challenging tasks for the chairman. 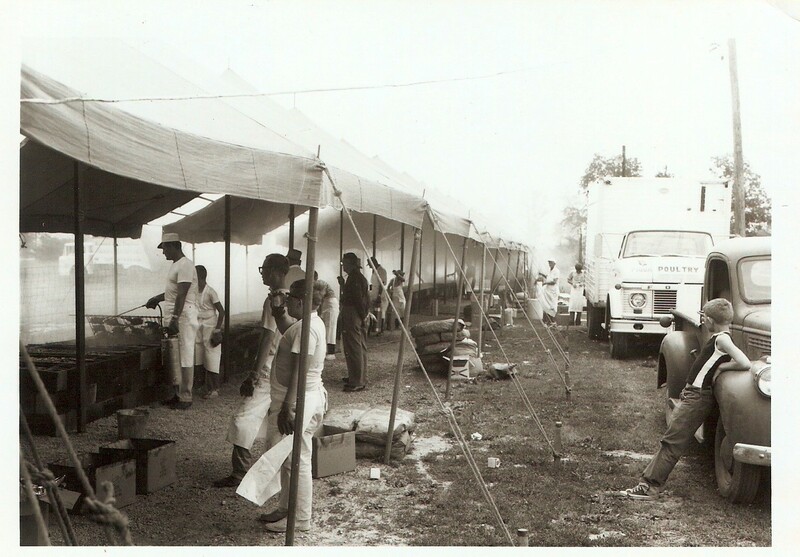 One of the most popular additions to the weekend of events occurred in 1974, when the Social Tent was established as the area’s first official social tent serving beer on a closed State Highway. Over the years festival entertainment has ranged from orchestras to modern bands. Local musicians with bands like E-Z Rider, Bushwack, The Bumble Bees, Renegade, Free Rider, Eight Ball, Love Junkie and many more have filled the Social Tent with crowd-pleasing music. True to this day local bands with members barely out of middle school follow in the footsteps of legends like Jimmy Baltes and his orchestra. In 1974, Poultry Days incorporated, instituted by-laws and the Chairman structure was established. Unique among festivals it provides for a minimum of a six year commitment to become a festival chairman. The festival has persevered when faced with several struggles including a storm and tent collapse in 1981 and a tornado touchdown in 2008 (which didn’t stop several concerned citizens from guarding the social tent despite the storm). Each chairman and board has taken the responsibility of running a quality festival while working to improve the festival each year. The Poultry Days board has been a small, but dedicated, group that in the last few years has grown to 23 members as the organization has worked to expand and improve the festival. The group meets year-round planning, preparing and looking for new ways to improve the festival while continuously supporting other organizations as well. Including, for the last ten years, conducting an annual Blood Drive. Over the years we have seen many contests and events including dog shows, talent shows and the “Tour de Versailles” cycling event. In 1972, there was a 150 plane fly in and the first of several “Chicken Meat” track and field tournaments. There have been treasure hunts, fireworks, Coterie club’s Ice Cream smorgasbord, antique auctions, softball tournaments, a Volksmarch, quilt shows, water ball tournaments, FFA petting zoo, a Tug-of-War, cheerleading, quilting, lip sync and cooking contests including the Ohio Egg Cooking Contest. Many of these events continue including the Cake and Egg Show, Golf Scramble, Flower Show and Art Show. And there have many more recent additions such as the 5K, Hoopin the Coop, SuperFit, and Photography show. The Versailles Community Chorus and later the Towne and Country Players presented productions including Oklahoma, Annie, and The Pajama Game. The festival also provides an opportunity for area organizations to raise funds, including K of C Bingo, the Rotary Lemonade Stand, Band Boosters, and Serendipity Mothers. From the very beginning the proceeds from Poultry Days has been invested back into the community to support community projects and school activities including donations to the Versailles Pool, Life Squad, Worch Library, and School Development Association. A wide range of school activities have been supported ranging from sports equipment to band uniforms. The festival began work on its own project and on July 4th 1985 Poultry Days dedicated Heritage Park. Originally intended to be a new location for the festival, the project evolved into a 40 acre park including ponds, a walking track, shelter houses and sports fields. The park is also home to several thousand Ultimate players each summer. While Poultry Days continues to fund the park, the independent Heritage Park Board was established to oversee and maintain the park. Poultry Days has donated in excess of $700,000 over the past 10 years. Overall the festival has become a Versailles area “holiday” event. One in which not only friends and families can gather, some on the festival grounds, some in backyards and porches, but also where visitors are warmly welcomed. This small town village of only 2,687 residents attracts crowds exceeding 50,000 people over the course of the festival weekend. With a record of 26,101 dinners in 2002, the festival is quickly approaching its one millionth dinner sold. When this project began it was expected to consist of only a few paragraphs summarizing the festival, yet it quickly grew as more and more stories were collected. In fact, there were far more stories, businesses, and individuals involved then can be mentioned in this piece alone. While I have learned many of these anecdotes from my personal experience attending the festival over the years as well as by serving on the board what I already knew about the strong community ties surrounding this festival was reinforced as I spoke with festival old-timers and read through dusty minutes and faded newspaper articles. The businesses supporting the festival have changed, as have the volunteers, but the spirit of the festival has remained constant and reflects a community with strong traditions and values. More than rides and parades the event has evolved from a festival to a local holiday which reunites families and friends. To view our growing collection of festival pictures go to www.versaillespoultrydays.com. We encourage anyone with a picture or a story about the festival to email chairman@versaillespoultrydays.com or mail Poultry Days directly at P.O. Box 108, Versailles, Ohio 45380. The annual Versailles Poultry Days festival is held the second full weekend in June and is only getting stronger each and every year with your support. Come join the tradition.